Are you one of the lucky few who own their own home bar? Like to get technical when you tipple? 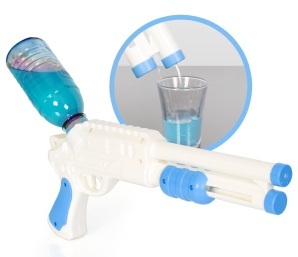 Then here are 10 great gadgets to make your geek bar a cooler place to drink. 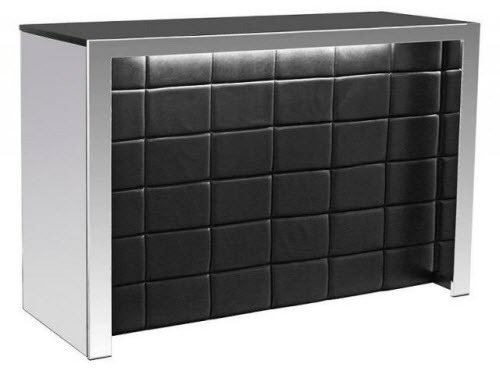 A Studio 54 styled stunner, the Hollywood Home Bar is a standalone bar with a polished chrome front, mirrored sides, LED 7 colour change lights and a white faux leather upholstered front. Not one for the introverted, you might expect to find Tom Cruise shaking up some cocktails behind it. If you do, tell him to get his own home bar. While we’re on the subject of cocktails, there’s perhaps no better way to shake them up than putting them through a cyclone. Enabling all manner of consciousness-threatening concoctions to be mixed at the touch of a button, the Cyclone Cocktail Mixer is a must for creative mixologists. Sometimes wine rather than cocktails is the order of the night. 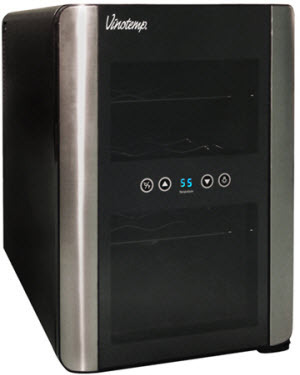 Every bar owner likes to impress people with their cellar and that’s sure to happen if you have an iCellar installed. Keeping up to 12 bottles of plonk at the perfect temperature, the iCellar’s sleekly chic modern design makes it a stylish addition to any home bar. The ladies are out, the lads are in and it’s chugging time. 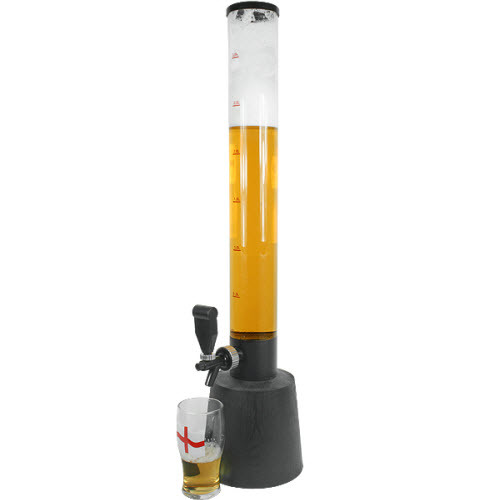 Capable of holding 6-7 ice cold pints of beer (or another drink if you wish), the Giraffe Beer Tower is an awesome piece of kit that cuts down those annoying trips to the cooler that waste good drinking time. Get a few and you won’t need to stand up until you no longer can. Combine this little beauty with the Giraffe Beer Tower and you might not emerge for days. 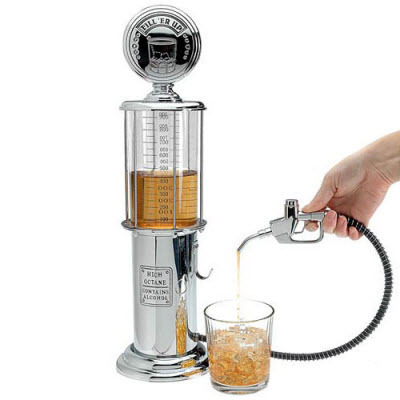 Modelled on the super cool liquor dispensers of yesteryear, this retro classic resembles an old fashioned gas pump specially designed to keep you and your guests topped up with spirits. The Rat Pack probably had these sown into their inside jacket pockets. A truly cool gadget, the Ice Jacket threatens to make drink fridges obsolete with its innovative design. 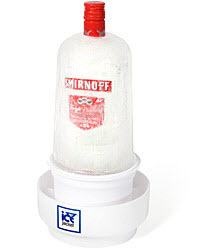 Wrapping around the bottle of spirits, the Ice Jacket envelopes it in an awesome layer of frosty ice that is as dramatic looking as it is practical. Really impressive, it’s the best way to stay cool in your bar all year round. 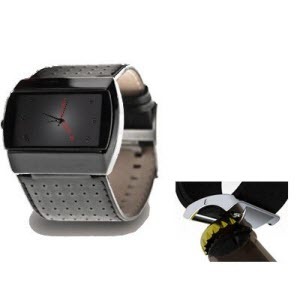 Q didn’t come with anything near as useful as this Bottoms Up Happy Hour watch for dedicated boozer James Bond. Not only does the Citizen 2035 water and beer resistant watch tell you when it’s Happy Hour and time to get sozzled, it has a unique bottle opening buckle, meaning you can move from time check to bottle neck in one fluid movement. If he was still with us Keith Moon ‘the Loon’ would have snapped one of these up before you could say “Pink Elephants”. 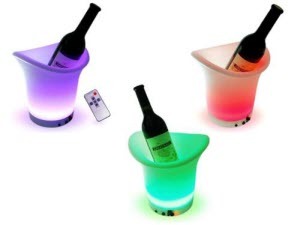 A remote control enables you to choose the colour of the LED lights that illuminate the ice bucket. 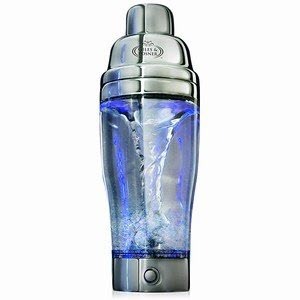 A perfect gadget for those heavy nights when blurred vision prevents you from finding the next glug in the gloom. Offset the guilt over what you’re doing to yourself by doing something for the environment. 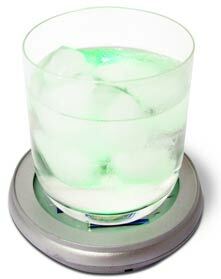 These mesmerising drinks coasters use solar power to charge up an array of eye catching coloured lights that filter through your bar glass, floating a disco through your drink. This article was produced by home sports and entertainment online catalogue Home Leisure Direct – suppliers of pool tables, foosball tables, arcade machines and more home entertainment products. Hey ArielaRoss i like your blog well done!